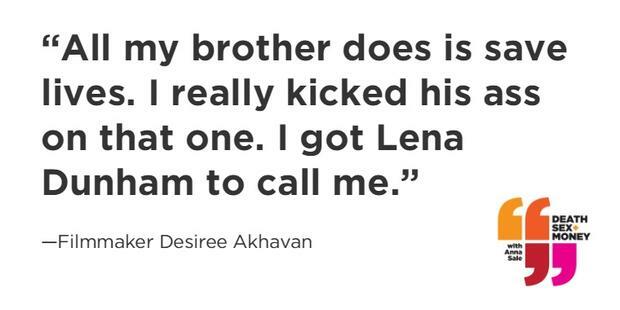 At 16, Desiree Akhavan says she was voted the ugliest girl at her school. In a play that she wrote that same year, Akhavan included a sequence based on the incident, turning a sad, victimizing event into something entertaining. But when you ask Akhavan, now a successful 30-year-old director and actor, if her work is healing, she’s hesitant. To her, it&apos;s more about using the original event creatively, and turning it into a narrative she can control. There is real-life truth in the stories she’s telling. In her debut feature film, Appropriate Behavior, Akhavan plays a bisexual Iranian-American—like herself. The main character, Shirin, lives in Brooklyn, and has just broken up with her longtime girlfriend. Shirin&apos;s brother is a doctor. She struggles to be open about her sexual identity with her family. All of these things have been true for Desiree. The film garnered positive reviews at Sundance, and also won her a fan in Lena Dunham, who cast Akhavan in the fourth season of HBO’s Girls. In the series, she plays one of Hannah Horvath&apos;s fellow students at the Iowa Writers&apos; Workshop. As Akhavan becomes more prominent, she says she fears that if her next film isn’t a hit, she won&apos;t have another shot at success. I spoke with her recently about finding humor in her post-breakup misery, what it meant to get that call from Dunham, and how feeling invisible as a kid motivated her to boldly tell her story. Watch the trailer of Appropriate Behavior, in theaters in twelve cities and on iTunes on January 16, 2015. Watch the final episode of Akhavan&apos;s web series, The Slope, co-created with her ex-girlfriend, Ingrid Jungermann. Their breakup inspired Akhavan&apos;s film, Appropriate Behavior. Season 2, Episode 8: "Miserable Best Friends Who Used To Be Together" from The Slope.